"The Air Force launched the unmanned spacecraft Tuesday hidden on top of an Atlas V rocket. 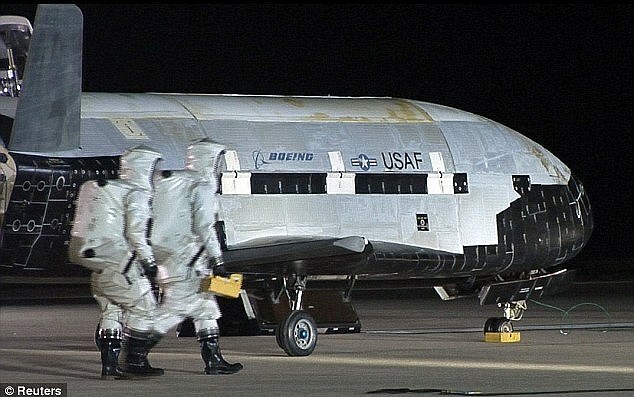 It's the second flight for this original X-37B spaceplane. It circled the planet for seven months in 2010. A second X-37B spacecraft spent more than a year in orbit. These high-tech mystery machines — 29 feet long — are about one-quarter the size of NASA's old space shuttles and can land automatically on a runway. Don' wanna know. What is that photo? Unmanned, 29 feet long, seven months, two "blahblahnauts" in the foreground with a suitcase? What is this, the "Masters and Johnson Space Center Report?" Geez harry didn't you read the quoted text? 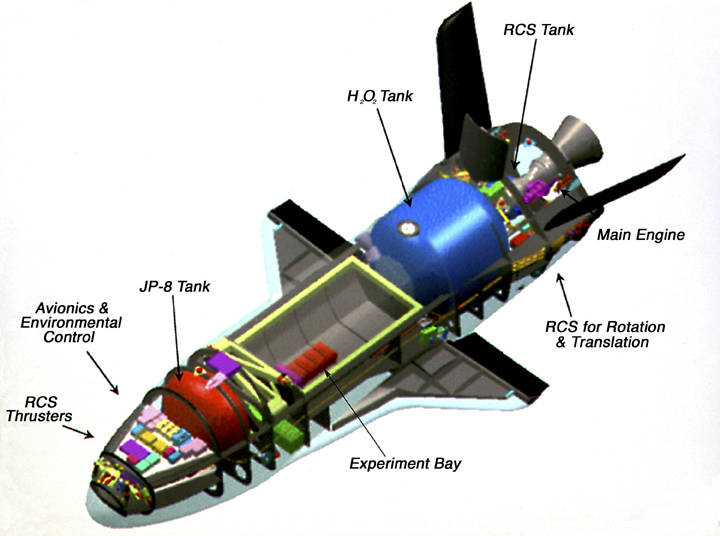 X-37B, a USV.... These high-tech mystery machines — 29 feet long — are about one-quarter the size of NASA's old space shuttles and can land automatically on a runway. What a coincidence, we launch the X-37B which can manoever in orbit and the North Koreans just launched a satellite. I was just amused by the two people dressed in what looked like 1950s sci-fi space suits and the wild thought of them crammed into the experiment bay (which I know they wouldn't be). I can't think of any reason why the military would be doing this, other than to prove (again, at twice the price) that space vehicles are re-useable. Last I checked the military wasn't into rapid prototyping technologies, much less space tech. That's DARPA's job. At the end of the day I think this is nothing more than something to distract the world spy agencies. (somewhere in the Kremlin): "The Americans just launched that X-37B again!" "Quick, track it and take photos of it! Bring one of ours into range as well!" Yeah but did it make it into space and one thing we will get support from Russia to at least move it into a orbit where it will decay an Re-enter the atmosphere burn up over the middle of the pacific and we both can jointly watch and track it to make sure it burns up over ocean and does not pose a threat to everyone. no one wants to have to go pick up NK satellite debris or risk it killing or causing major damage to major populated cities around the world. Because pretty sure NK is not able to track it and or be able to fire boosters or maneuvering Rockets to Reposition it to change the rate of decay or the angle of decent from the NK space command and control centers or what ever commands the space program there. Also Russia and China along with the west are just as worried about the ever growing amount of space debris that is getting to the point we need to clean it up. Which puts even more risk to possible future missions to be sending up new communication sats or having to take even more risks at manned trips to the ISS or due most of the debris that was sent from earth is ours and we kind of have to be the ones that clean it up or help with the effort to clean it up. The U.S. and Russia being the pioneers that made it possible that we both left most of the junk up there to now deal with. We have some responsibility to make sure we keep it safe for future missions to continue exploring space since it took a lot of people and a lot of failure and innovation to get this far and NK never could do it from scratch like we did or if it was even possible to send a human into space and come back alive which a lot did not and it if it poses a major risk to current and future crews then taking it out of orbit is the right thing to do IMO. Sure NK will have to sabre rattle stomp their feet and maybe send out their navy and the next U.N. event go on a rant about us but in the scheme of things the lives of the men an women that are currently in in space are reason enough to destroy or dispose of it properly. Heck I bet no U.N. security council members will even talk or care about it because every member has some sort space program and would agree that taking out a possible risk now is worth it even if it makes NK ticked off. Heck we are having fun up there I mean love to see hopwthe crews of have have fun up there when not working on experiments or maintaing the station since looks like fun.